The exhibition will show several new products and developments by designers such as Andersen & Voll, Edvin Klasson, Kristine Five Melvær and Ralston & Bau - along with objects by Kneip, Hallgeir Homstvedt, StokkeAustad, Jomi Evers and Emma Staubo. We are also excited to introduce a preview the project, the INN Book Of Patterns - a series of collaborations with designers and artists approaching decorative patterns from new angles. The first INN entry is a pattern concept designed by London-based architects Space Popular and applied on a digital jacquard weave. The Elementa UT project, introduced in 2018 is an ongoing inquiry into the question of how we can use design and art to enter into a more sensible and meaningful conversation with nature. The Klorofyll Planter System by Andersen & Voll is a comprehensive series of planters of different sizes and materials , developed to explore interior landscaping. Klorofyll table pots in Terracotta - designed by Anderssen & Voll + dB Silent sideboard by Jonas Stokke and Øystein Austad of StokkeAustad, featuring thick acoustic wool felt in the held in place by solid oak wood slats. Part of the Elementa UT project, Koloni is a micro-architectural structure made to shelter pollinating bees. The hotel consists of a rugged aluminium exterior protecting an inner core of solid wood with various sized rooms, ensuring warm and dry nesting facilities. Koloni is a collaboration with Norwegian aluminium manufacturer Hydro. A stackable stool that combines classical elements in a new way. The name is inspired by the legs which moves up and down around the stool in a steady rhythm, giving the furniture its recognizable character. A lightweight and minimalist coat stand compromised of only two parts. Clothes hangers can be hung underneath the tallest loop, and the way each hook is angled makes for generous spacing between each garment. Stian Korntvedt Ruud & Jørgen Platou Willumsen of Kneip have designed Ur - a pair of in handmade enameled stainless steel water cans - made to elevate the ritual of sharing water with plants. 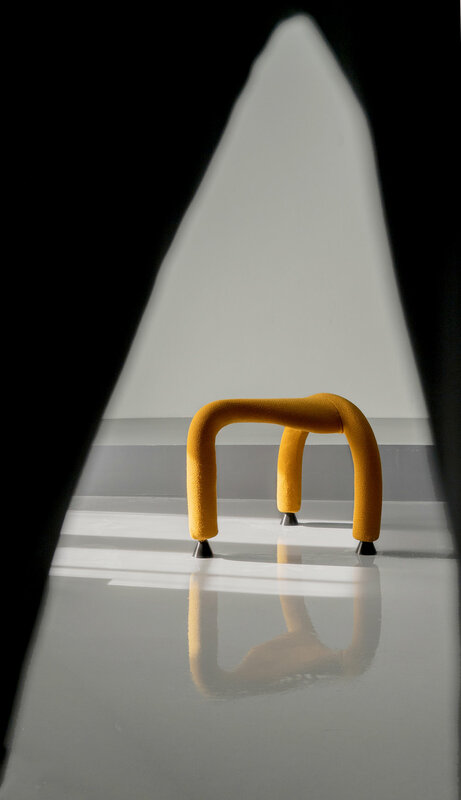 Named after the Egyptian god for writing, Tot is a fantastical seat that suggests the medicinized look and feel of conventional work furniture is a passed stadium. Its three legs provide great stability and freedom of movement, giving excellent support to any seated activity. The Derive is a meditation object that has emerged from the field where the forest meets the digital realm. Touch it gently to drift into a lush soundscape transmitted in real-time from a listening station placed deep into a Norwegian forest. Murmur is a system of room dividers based on solid wood structures draped with textile - to provide visual privacy and sound comfort, essential in open work environments. Adjusted to the human scale, the Murmurs invites for personal interaction; touch, move and hook onto it. Murmur is a new way to functionally and decoratively use textiles in modern interior architecture. Unique in its category, the Murmur is an open and repairable design, using only natural, healthy and recyclable materials, without glues, petrol or staples. Isometric projection provides at once the illusion of depth and the lack thereof. While we can perceive three-dimensionality in an isometric drawing, we cannot appreciate how far or how close an object is, as things do not appear larger or smaller as they extend closer to, or away from us.